There is a lot of focus on EQ's atm, most understandably. But 'we' need to observe the volcanic activity as well (and I'm sure many people do). I feel there may be some considerable 'issues' building in some areas. There may be more simultaneous eruptions to occur at some point. Underwater volcanoes, in some regions are becoming more active or are surprising some with their appearance. This post is relevant to the earthquake thread as well. The above volcano is erupting. With all the quake activity in this region, I wonder how big the ultimate eruption/s will be? Or if it is just 'energies' passing through/up/by....? Well gee wiz...I came across this article just now which discusses exactly the type of energies I have mentioned in the earthquake thread. The mental picture that the scientist builds, as you read the article, is spot on with what was going through my scientifically untrained mind. Anyway "Is the Earth cooking up another super volcano"
"Extinction Level Super-Volcano growing in the Pacific"
With what has been occurring for the Santa Cruz Island regions, the content of this article sort of 'confirms' the feelings I have been having about the where particular energies may be hovering deep below. Even though a mega eruption of this description could express itself in other regions too, I have been 'stuck' on the Pacific region (near Wallis and Fortuna/Solomons (and surrounds)) for a very long time (years) now. But hey, I am no visionary or prophet (so don't rely on my words for scientific info. ), but I feel that the volcano near Santa Cruz Is. is still one to keep an eye on for the time being. Though the energies there may 'move' to a region (far WNW [of the globe] or NE and/or SE of the Pacific). I am a bit of a fan of antipodal impactor caused mantle plumes. i.e. 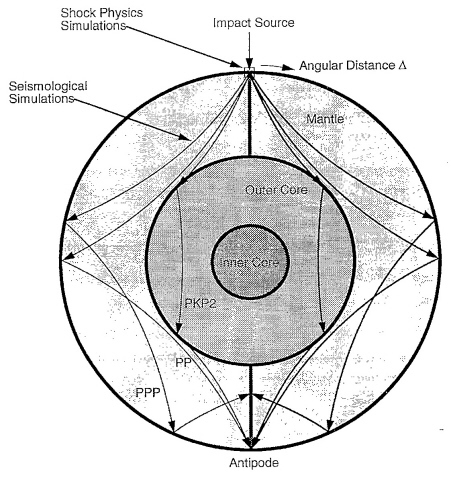 the seismic shock propagates through the elastic mantle (and around the liquid core) such that there is a convergence at the antipodal point - which then creates a long lasting crustal weakness as evidenced by a "permanent" mantle plume / hot spot. I am a fan of the Chicxulub impactor causing the Deccan Traps volcanic activity for example. And we also have known antipodal volcanic activity at similar times elsewhen. See Siberian Traps and Wilkes Land Impactor and the (suspected) Bedout crater. but there is the possibility that if the impactor hits at an oblique angle, then the antipodal shockwave convergence is shifted. There is also another possibility, where it may be that there was an impactor that disrupted the antipodal mantle earlier, created a weakness but the resultant hot spot remained sub-crustal. There was then a second nearby impactor that then triggered the volcanic activity - and this one may not have needed to be "exactly" antipodal. For example, the Morokweng crater in South Africa is antipodal to Hawaii. Whilst we can't be sure exactly when the Hawaiian Islands hot spot started, the northern islands are at least 80 million years old. The initial lava flows must have been much older. The 2 billion years old Vredefort crater is only a couple of hundred Km east of the Morokweng crater. It is possible that one reason for the enormous mass of the Hawaiian Islands is that they formed on top of a sub-crustal hot-spot caused by a very ancient previous antipode impact nearby. That's an interesting set of information Arnost. 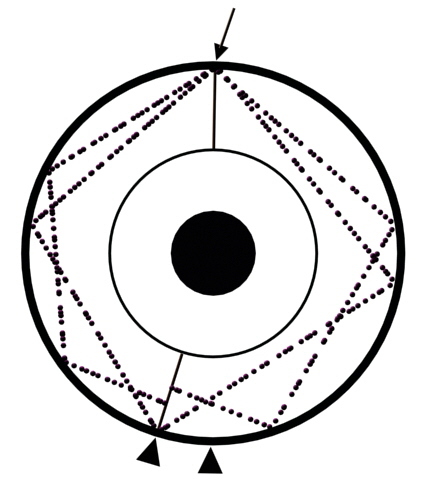 When you consider that, regarding physics dynamics, when an object scores a vertical hit on an surface, the resultant energy is displaced in a fairly uniform fashion (that's assuming the surface it hit has no deviations in its form [such as a huge mountain formation] - with the strongest force from the impact being directed down from the impact point). But, as you mention, if the object (e.g. asteroid) hit the surface at, for e.g. a 90degree angle, the energy from the force would be generally on an angle relevant to that angle of impact. A good experiment to see a possible example of these impact dynamics, is to use an egg (or a sphere, with a breakable surface and filled with liquid or powder) an piff ball bearings at it. This was one my experiments I used to show 'force' and displacement of energies. I believe in cause-and-effect, and what you mention in your post Arnost is very interesting. I'd better stop here I just get a bit carried away when talking about physics etc.. Here's a very interesting article I came across regarding an under-sea volcano blow-out in the southern Pacific. I feel that somewhere in the western side of the Pacific, that an underwater volcano mound may become more evident. This obviously only says a 'mound more evident' and appears somewhat vague. I quietly (actually) felt that this was going to be more than a mound being more obvious - sometimes I down-play my feelings about some 'maybe' events, as I don't want to be an alarmist or scare-monger. I kept getting drawn to this general region for the potential release of such previously 'unseen' volcanic energy. Hang on folks....just checking 'dates/times' on the last post. 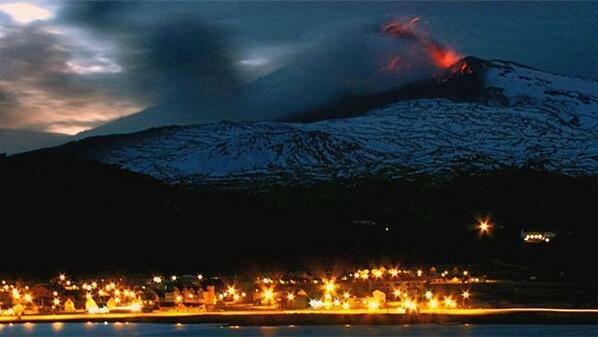 I think this volcano may be acting up atm., but I'm finding conflicting times/dates in other articles on this region. Jeez you're fast! I only came across Copahue just then! This ol' duck has some zippiness left in her yet Arnost. I even cooked a gourmet dinner in 20 minutes last night...excelled myself...another brewing as I type...kids are impressed...cats stunned....dogs faces glued to the kitchen window in awe and feeling good coz I solved the rat problem at my house (they were outside - not in). (Melbourne is in the middle of a rat plague). There hasn't been an update on Sernageomin since 29/5... That update suggested that there were increasing tremmors. The compulsory evac zone is 25km - and evacuations continue. What an amazing photo - though beautiful in so many ways, unnerving in another way. I wonder how the folks who live on the shoreline here feel. There is an update on the Sernageomin site. Whilst the swarm of earthquakes continues, thes have decreased to about 40 an hour (av 1 magnitude). An explosion on 17 June produced an ash plume that rose more than 4 km, and ejected incandescent tephra up to 2 km from the crater. Some of the high-temperature fallout caused small fires in grasslands on the flanks. Ashfall was reported in Tetela del Volcán (20 km SW), Ocuituco (24 km SW), Yecapixtla (31 km SW), Atlatlahucan (30 km WSW), Cuautla (43 km SW), Tlayacapan (40 km WSW), Yautepec (50 km WSW), Jiutepec (60 km WSW), and Xochitepec (70 km WSW) in Morelos state. Ash also fell in Ecatzingo (15 km SW), Atlautla (17 km W), and Ozumba (18 km W) in México state. The Alert Level remained at Yellow, Phase Two. I've been remiss with this thread in not posting much here. But anyway, here's a link to an article about a volcano in Japan that has just blown 'it's stack'. This leaves me wondering if it's sister, Fuji, may become more active too..? Between earthquakes and volcanic eruptions, what's next for the poor folks in Japan? "Massive eruption at Sakura-jima volcano...apan" by Adonai This article has videos of the eruption. I don't always get time to keep up to date info on all of the sections of General Science here so, here's a link to Volcano Discovery's page regarding all of the Volcanoes which are erupting. active and so on. There seems to be an increasing occurrence of volcanic activity and for quite a while now, I have been gabbling on on my blog about the potential discoveries/recognition of submarine volcanoes and vents coming to life here and there, and this appears to be happening. There seems to be, as I felt there would, an increase in 'energy' surrounding volcanoes, in harmony with several of the larger quakes. This dynamic earth certainly an interesting entity.